Mary Louisa, often called Louisa, and her family were among the pioneers of the Oregon Territory. 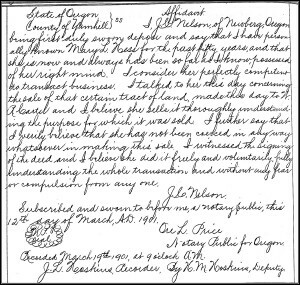 They’d been there long enough by 1850 to have had three children born there.3 The county where they settled, Yamhill County, was primarily farm country,4 though Joseph was shown on the census as a merchant. But by 1870 Joseph was a no-show on the census. Mary Louisa, age 52, was recorded as head of household with five children ages 11-19.6 And before the 1880 census, Joseph was dead. The story was that Joseph took off for California, ended up back in Oregon with another wife and other children, and died — by murder or by accident — from a blow with an axe.7 The full story of the split between Joseph and Mary Louisa isn’t shown by the records I was poking around in. The story that is shown is of a woman who began to live — and control — her own life and affairs. 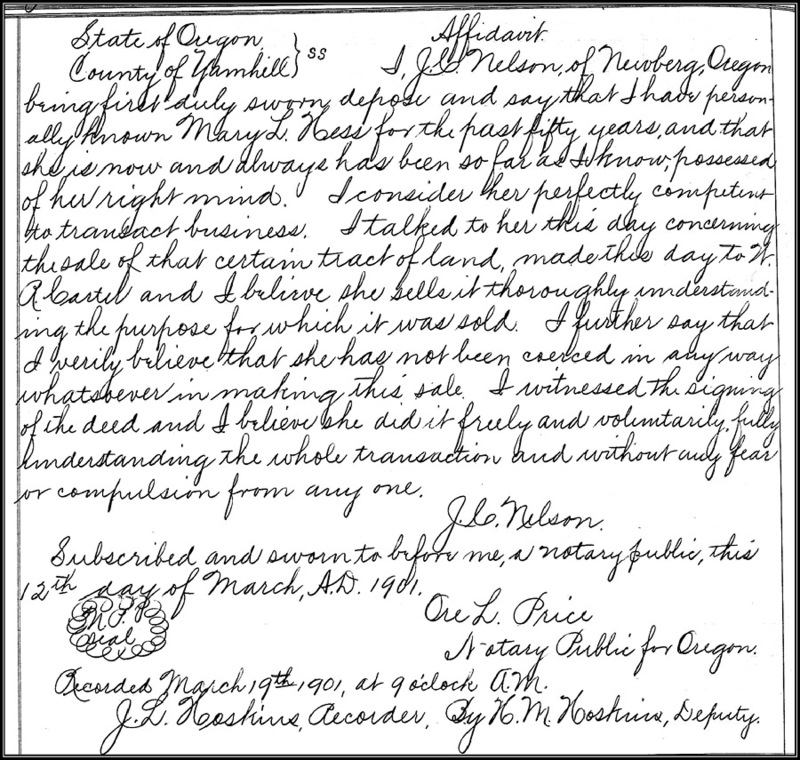 So what must it have been like for this proud and independent woman when, in March of 1901, all of a sudden, she had to prove she was competent to transact business? That she knew what she was doing? What in the world could have prompted the requirement that, count them, four separate affidavits — including two from medical doctors — had to be filed before a deed was recorded? Perhaps she’d been ill. Perhaps one of her 13 children was worried about his or her inheritance. Perhaps she’d just been a silly old woman — she was, after all, 84 years old at the time — and worn purple with a red hat. We don’t know. We don’t even know how she reacted to this indignity. I’d have been furious. Maybe she was too. Or maybe she understood, for reasons lost to time. All we know for sure is that these two pages of an obscure record book tell a story about Mary Louisa that would be easy to miss — but that ought by rights to be part of her history. Looking at the ages of her children, I would almost bet it was one of them trying to get control of her business affairs. If that was the case, we can only hope “Mom” cut them out of the will. I suspect you’re right — and I agree!! As far as my research has gone is that my great great great grandmother didn’t cut anybody out of anything. If you know of any reason why her competence would have been challenged, it’d sure be good to know the rest of the story. This is my great, great, great, great grandmother. I’m so happy I came across this article. How very interesting, Joe! Glad I came across her story.